Meraki Client VPN does not natively support two-factor authentication, a third-party solution is required for this configuration. Starting from v0.2.1 TOTPRadius can serve as an LDAP proxy, a feature that allows implementing two-factor authentication with the systems that do not natively support it. Different from Citrix StoreFront, Meraki CVPN does not have any standard way of calling the REST API of TOTPRadius appliance. However, it is still possible to implement self-enrollment with Meraki CVPN by using VPN Connection entries prepared with Microsoft Connection Manager Administration Kit (CMAK). Detailed instructions can be found here. ► If you decide to allow self-enrollment, make sure "Allow ldap enrollment" parameter is enabled. 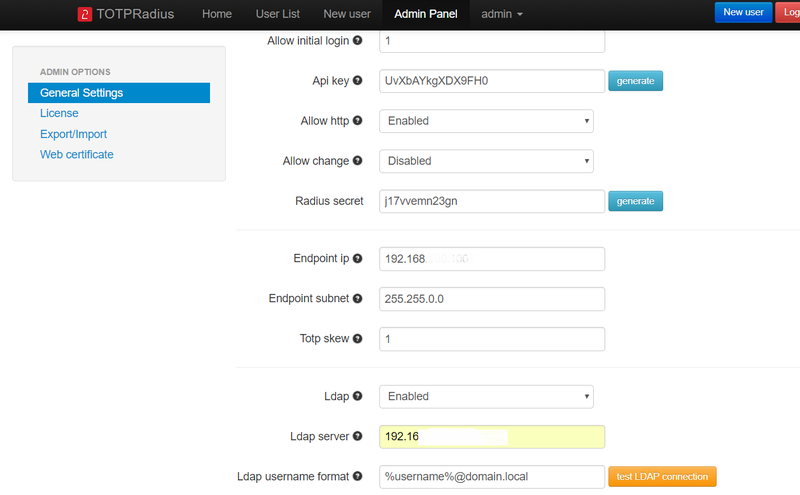 In the same section you can also allow reenrollment and modify the intro text of the LDAP web enrollment page. ► Log onto the Cisco Meraki Dashboard and navigate to Configure > Client VPN. ► Select the option to enable the Client VPN Sever. ► Set the Client VPN Subnet. This will be a unique IP subnet offered to clients connecting to the MX Security Appliance via a Client VPN connection. ► Specify the DNS servers. ► Enter a shared secret that will be used by the client devices to establish the VPN connection. Note: This is a different value from the RADIUS shared secret. ► Select RADIUS as the Authentication method. ► Click the Add a RADIUS Server link. ► Enter your TOTPRadius IP Address. ► Enter the RADIUS Port that the MX Security Appliance will use to communicate to the NPS server. For TOTPRadius integration keep the port as 1812. ► Enter the RADIUS Shared Secret (established when the MX was added as an authenticator). Installation of additional software is not required on client devices. The Cisco Meraki Client VPN solution uses L2TP over IPsec, which is supported by almost all device's built-in native clients. Refer to Meraki Client VPN documentation for client configuration instructions. However, the standard methods of creating Client VPN connection entries for Meraki are not supporting self-enrollment feature. To create VPN Connection entries, refer to our CMAK guide.